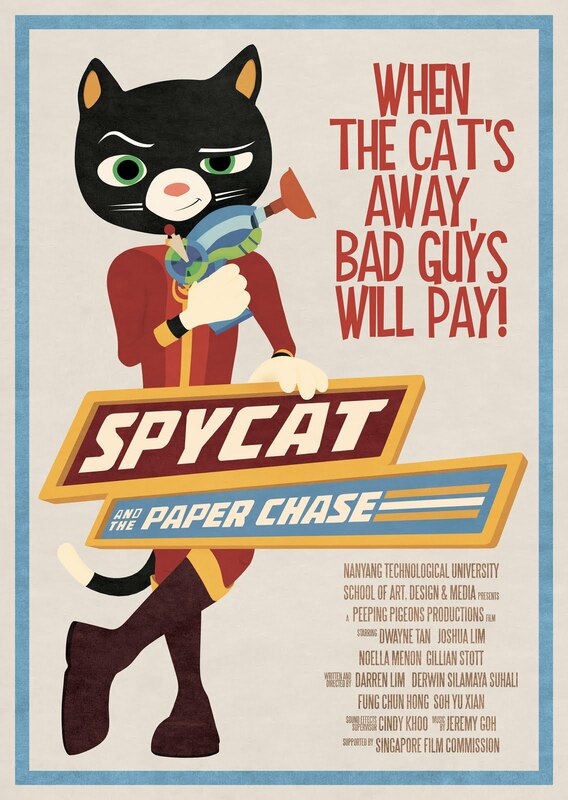 Spycat & the Paper Chase tells a fun story of an ordinary pet cat who carries a double persona as a secret agent. Light hearted and fun, the animation is a one part episode of a series that the team hopes to expand in future. We speak to filmmakers Darren Lim, Derwin Silamaya Suhali, Fung Chun Hong & Soh Yu Xian who made the animation piece as part of their final year project at the School of Art, Design & Media. 1) How did the idea for the film start? DL: Some of my relatives own cats, and these cats frequently disappear for long periods of time doing goodness knows what. I sometimes wonder what these cats are up to when no one’s looking. The idea for Spycat – a housecat who goes off on secret missions – came from that premise! 2) Which is your favourite scene and why? DL: It’s gotta be Honeycat’s mission brief for me. I like how Honeycat manages to be elegant and high-strung all at once! I also love how stylish and anachronistic Honeycat’s office is. She’s got a sleek white computer and a vintage candlestick telephone. How cool is that? CH: Mine would have to be the one where Spycat breaks into Captain Chico's airship. He’s all cool and confident and James Bond-like, but then he gets ambushed by Captain Chico’s Dogbots while dusting himself off! I spent a lot of time animating that scene, so I guess I'm kind of biased towards it. DS: One of my favourites is the Facebook scene, which I animated. I like the simplicity of Captain Chico's finger-snapping movement. But the most beautiful scene has to be the closing scene set in Ashley's bedroom. I like the colours used. YX: I like the ‘Tron’ scene where Spycat transitions between his two identities. Spycat’s actual transformation is obscured from view, but the fatsuit should explain everything! Spycat’s red suit also works really well against the luminescent background. 3) What were some difficulties you faced making the film? DS: Every step of the production stage had its own unique set of challenges. We learnt alot during the entire process. CH: The biggest challenge by far was the sheer amount of labour required to produce a film of that length. At nearly six minutes, it's one of the longest animation final year projects ever completed at our school. The original script ran nearly nine minutes long. If we hadn't cut down on plot points and gags, we would never have finished the project on time. DL: Animation is time consuming and Spycat was very demanding on our lives. It took almost 11 months to finish Spycat and we worked on it seven days a week, from morning till night. On top of that, we had to find time to deal with other modules and electives. Looking back, I still don’t know how we did it! YX: With Spycat we tried to emulate 2D limited animation using 3D computer animation tools. We couldn’t simply apply what we learnt in school, so it was challenging to find out which rules of animation we could break with Spycat. 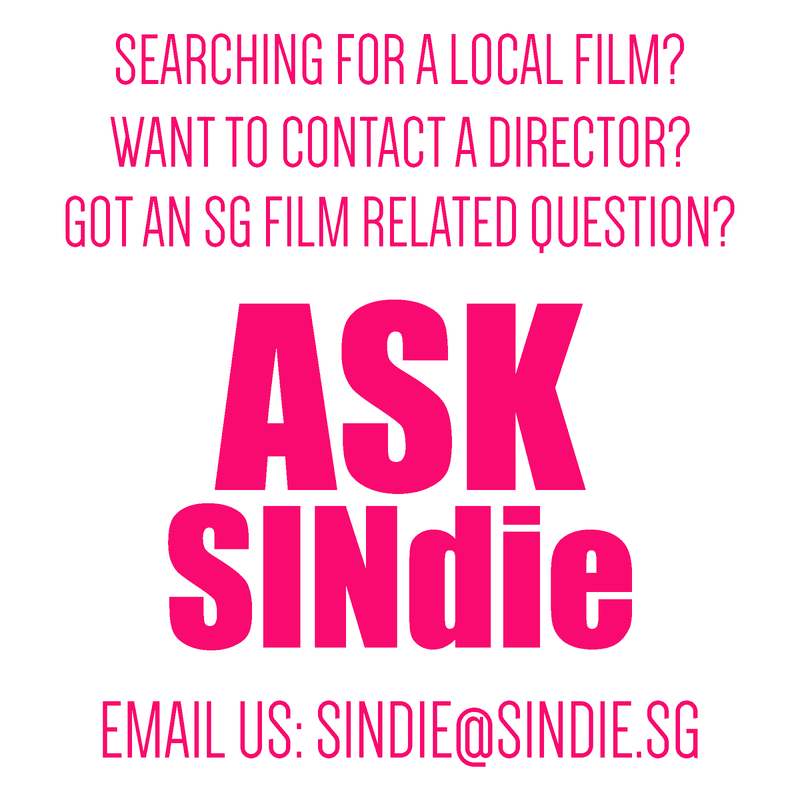 4) What did you hope to achieve with your film? DL: Right from the start, we wanted to create something that children would enjoy. The response from younger audiences so far has been very encouraging. CH: We hope to use the film as a teaser to pitch our concept to investors and animation companies. With sponsorship or funding, we could turn Spycat into a full-fledged television series, perhaps with its own merchandise! DS: Spycat can easily make roads into video games, books, graphic novels, TV shows, web series, you name it! But for now, we’re just concentrating on sending Spycat to film festivals. YX: We hope that our film can be shown in many places. Hopefully, it will be broadcast on some cartoon channel too in the near future. 5) What are some of your influences? DS: Saturday morning cartoon classics like The Powerpuff Girls and Dexter's Laboratory. And James Bond, definitely! We watched the entire James Bond catalogue to get up to speed with the spy genre. DL: We tried to infuse some of the aesthetics of 1950s-60s American television cartoons, particularly with our use of strong graphic shapes and flat shades. So as far as visual influences go, you have the usual suspects like Looney Tunes and Hanna-Barbera cartoons. Musically, we made Spycat’s soundtrack seem like it came from a videogame or cartoon series from the late 1980s to early 1990s – but updated for today’s audiences! 6) The film seems like part of a bigger series. Any plans to make more episodes? CH: Yes! Sometimes Darren and I discuss ideas for future episodes of Spycat during the long train ride home from NTU. My dream would be to get those ideas onscreen some day. DL: Spycat was definitely designed to be episodic. I dare say that this won’t be the last you’ve heard of Spycat! YX: Thanks to everyone who helped us in the film’s production. We really appreciate their effort. DS: Thank you for the interview! 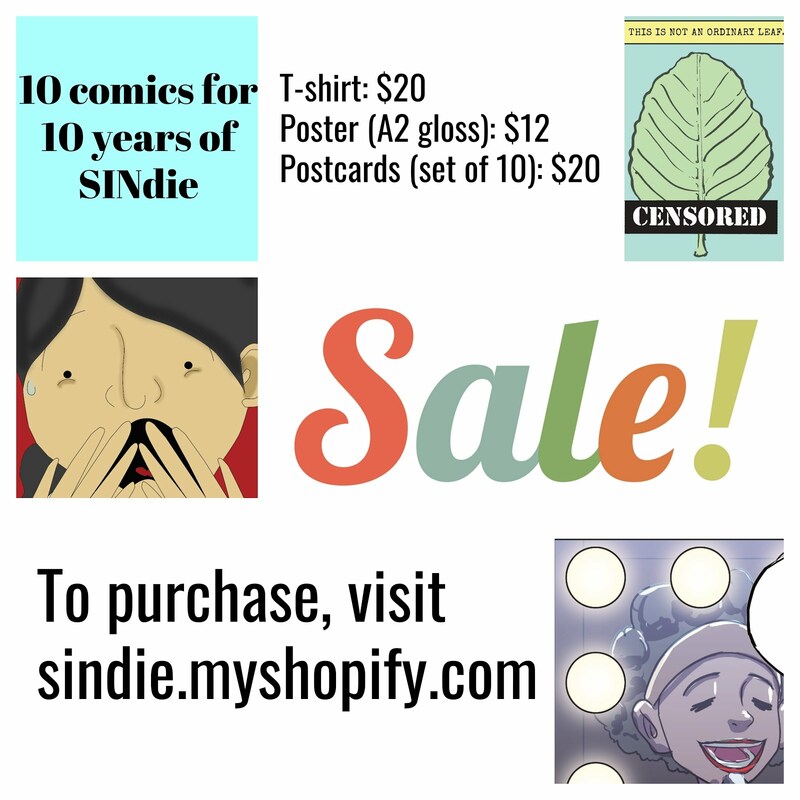 DL: Thanks to SINdie and to Ivan for the feature. We really appreciate the support! 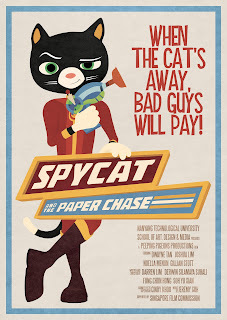 Spycat and the Paper Chase isn’t available online yet, but it won’t be long! CH: If you enjoyed Spycat and the Paper Chase, tell all your friends about it!